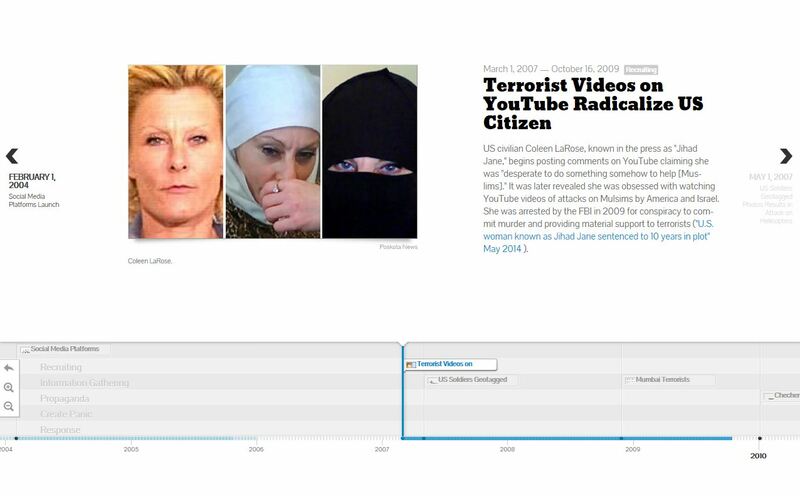 The Wilson Center’s Commons Lab just published an interactive timeline, using TimelineJS by the Knight Lab, on social media and terrorism with the assistance of scholar Gabriel Weimann and other collaborators. Screenshot of an event from the interactive timeline. This timeline highlights key events where terrorists and oppressive regimes used social media to spread propaganda, gather information, radicalize and recruit, coordinate activities, create panic and undermine stability. Manipulation of the public through social media presents new challenges for intelligence, law enforcement and humanitarian response organizations. Innovative responses and strategies will be needed to defend against these emerging cybersecurity and human security risks.